Wide bandgap semiconductors (such as SiC and GaN) are now being used along with traditional silicon in demanding applications such as automotive and RF communications because they can operate at higher frequencies, voltages, and temperatures with lower power loss. Improvements in the efficiency of traditional silicon designs, however, enable a strong value proposition to be maintained in many broad-market applications. Get to market faster for your power semiconductor devices while minimizing device failures in the field. Manually characterizing wafer- and package-part level devices for electrical performance requires learning new techniques, equipment, and probing infrastructure for low level measurement (e.g. pA of leakage current measurement in the presence of high breakdown voltage). Source current up to 100A and voltage up to 3000V, as well as optimize the often complex and time-consuming set-up changes between ON-state, OFF-state, and capacitance measurements with Keithley power device test solutions. 8010 High Power Device Test Fixture enables safe and easy connections for testing high power devices up to 3 kV or 100 A. You also need to safely set up the high voltage tests and quickly get results. Designing it manually requires programming expertise and the capability to design and build a safety-compliant system. You do not need to do it yourself. 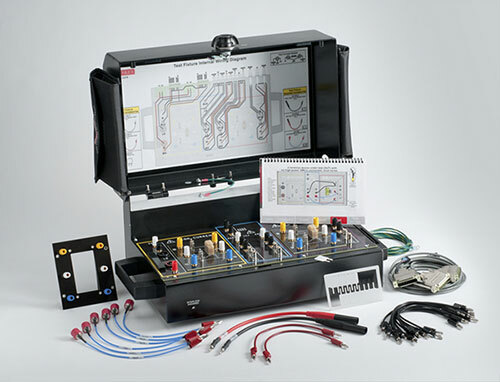 Get safe and easy connections for testing packaged parts up to 3000V or 100A with the Model 8010 High Power Device Test Fixture. Perform common I-V tests quickly and easily without programming with ACS-BASIC. 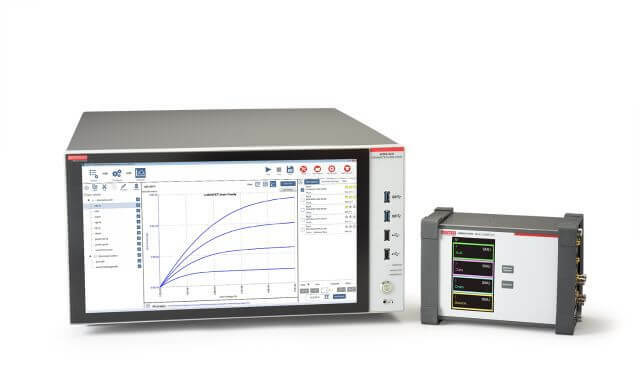 For devices like traditional Si and GaN requiring a smaller power envelope, get results quickly to meet time to market demands with the 4200A Parameter Analyzer that can automate all characterization tests up to 200V and 1A. 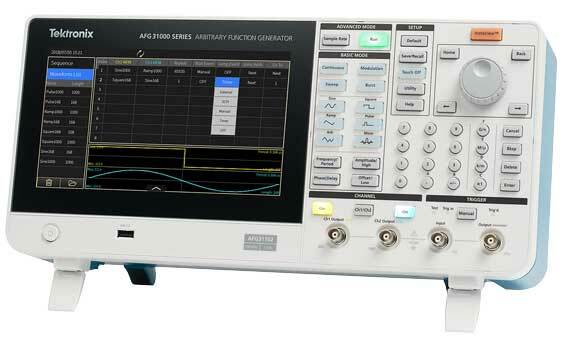 Floating differential measurements (such as high-side Vgs) are difficult or impossible to make due to high frequency (fast turn on and turn offs), and the presence of high common mode voltages (such as Vds) because oscilloscope probes do not have sufficient common mode rejection at high bandwidth. The poor common mode rejection leads to the measurement being dominated by the common mode error instead of the actual differential signal. 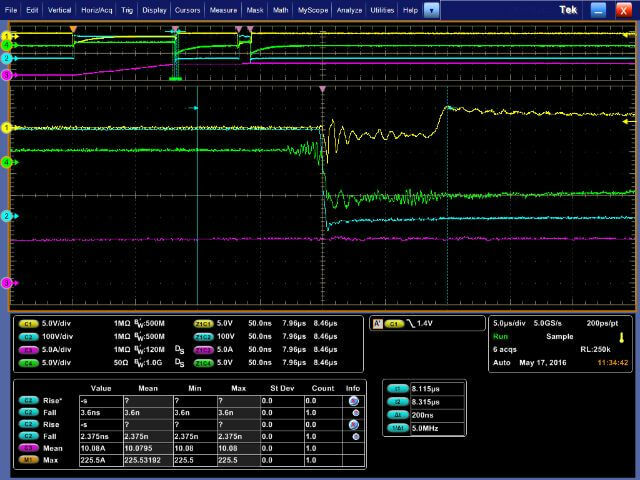 Tektronix has the only solution offering an isolated probe (ISOVu) that does not de-rate with frequency at the operating requirements of GaN and SiC devices, allowing you to make accurate differential measurements. This allows you to precisely calculate and prove conduction losses, dead time losses, switching losses. Additionally, if you are not using an integrated gate driver, the ability to make floating differential measurements allows you to precisely measure and control dead-time for turn-on and turn-off of your device. You can also now avoid overestimation of high-frequency emissions from power converters due to the transient voltage (dv/dt) and current generated during hard switching. One more thing to watch out for is the impact of probe capacitance at higher switching frequencies. Too much probe capacitance results in the rising edge of the being rounded off in the measurement, leading to important high frequency switching characteristics being lost. Also, adding the probe to the very sensitive floating gate signals can lead to damaging the device due to transient signals caused capacitance charge. The low capacitance of the ISOVu probe also minimizes probe capacitance issues at the gate and risk of damage to the device due to transient signals. With the IsoVu probe, the high-side gate voltage waveform can be accurately captured to evaluate and optimize switching performance and reliability without degrading dV/dt. Learn how to minimize connection changes, opportunities for user error, and frustration when performing comprehensive DC I-V and C-V testing of power semiconductor devices. This e-guide answers some common questions about making better semiconductor measurements, with a focus on DC I-V and capacitance-voltage (C-V) measurements. It also touches on more specific applications and how you can simplify making the measurements your most challenging applications require. 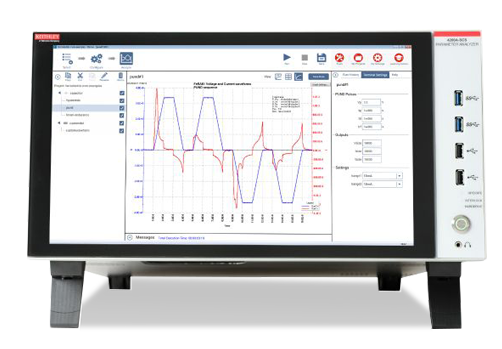 The 4200A-SCS ClariusTM GUI-based Software provides clear, uncompromised measurement and analysis capability. Furnished with embedded measurement expertise and hundreds of ready-to-use application tests, Clarius Software enables you to dig deeper into your research with speed and confidence. The 4200A-SCS Parameter Analyzer is completely customizable and fully upgradable, so you can add the instruments you need now – or later. With the 4200A-SCS Parameter Analyzer, making connections to your bold discoveries has never been easier. 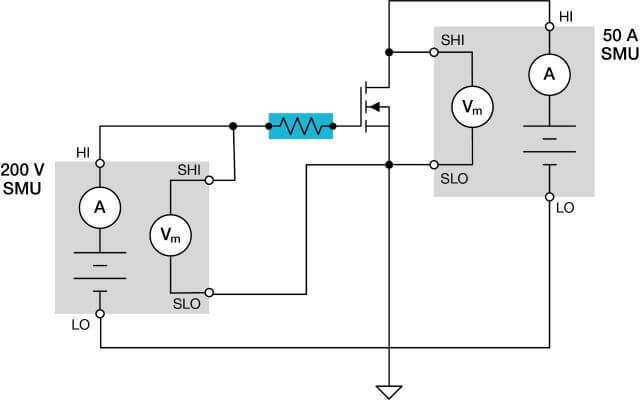 Developing and using MOSFETS, IGBTs, diodes and other high power devices requires comprehensive device-level characterization such as breakdown voltage, on-state current and capacitance measurements. Keithley's line of high power Parametric Curve Tracer configurations supports the full spectrum of device types and test parameters. Keithley's Parametric Curve Tracer configurations include everything necessary for the characterization engineer to develop a complete test system quickly. 2650A Series High Power SourceMeter® SMU Instruments are designed specifically for characterizing and testing high voltage/current electronics and power semiconductors, such as diodes, FETs, and IGBTs, high brightness LEDs, DC-DC converters, batteries, solar cells, and other high power materials, components, modules, and subassemblies. They deliver unprecedented power, precision, speed, flexibility, and ease of use to improve productivity in R&D, production test, and reliability environments. Two instruments are available offering up to 3000V or up to 2000W of pulse current power. IsoVu® probes are the right tool for today’s demanding power measurement challenges. They offer industry-leading 1 GHz bandwidth, 160 dB or 100 Million to 1 common mode rejection, 60 kV common mode voltage, large ± 2500 V differential range and superior probe loading.